Random House Trade Paperbacks, 9780375761287, 256pp. Patagonia is a strange and terrifying place, a vast tract of land shared by Argentina and Chile where the violent weather spawned over the southern Pacific charges through the Andes with gale-force winds, roaring clouds, and stinging snow. Squarely athwart the latitudes known to sailors as the roaring forties and furious fifties, Patagonia is a land trapped between angry torrents of sea and sky, a place that has fascinated explorers and writers for centuries. Magellan discovered the strait that bears his name during the first circumnavigation. Charles Darwin traveled Patagonia's windy steppes and explored the fjords of Tierra del Fuego during the voyage of the Beagle. From the novel perspective of the cockpit, Antoine de Saint-Exupry immortalized the Andes in Wind, Sand, and Stars, and a half century later, Bruce Chatwin's In Patagonia earned a permanent place among the great works of travel literature. Yet even today, the Patagonian Andes remain mysterious and remote, a place where horrible storms and ruthless landscapes discourage all but the most devoted pilgrims from paying tribute to the daunting and dangerous peaks. Gregory Crouch is one such pilgrim. In seven expeditions to this windswept edge of the Southern Hemisphere, he has braved weather, gravity, fear, and doubt to try himself in the alpine crucible of Patagonia. 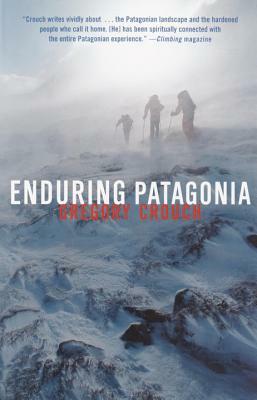 Crouch has had several notable successes, including the first winter ascent of the legendary Cerro Torre's West Face, to go along with his many spectacular failures. In language both stirring and lyrical, he evokes the perils of every handhold, perils that illustrate the crucial balance between physical danger and mental agility that allows for the most important part of any climb, which is not reaching the summit, but getting down alive. Crouch reveals the flip side of cutting-edge alpinism: the stunning variety of menial labor one must often perform to afford the next expedition. From building sewer systems during a bitter Colorado winter to washing the plastic balls in McDonalds' playgrounds, Crouch's dedication to the alpine craft has seen him through as many low moments as high summits. He recounts, too, the riotous celebrations of successful climbs, the numbing boredom of forced encampments, and the quiet pride that comes from knowing that one has performed well and bravely, even in failure. Included are more than two dozen color photographs that capture the many moods of this land, from the sublime beauty of the mountains at sunrise to the unrelenting fury of its storms. Enduring Patagonia is a breathtaking odyssey through one of the worldís last wild places, a land that requires great sacrifice but offers great rewards to those who dare to challenge it. Gregory Crouch grew up in Goleta, California, where he now lives with his wife, DeAnne, and their son, Ryan. He has made more than a dozen climbing expeditions on four continents, most notably in Alaska and Patagonia, and his work has appeared in National Geographic, Islands, Backpacker, Climbing, and Rock & Ice. "An otherworldly range of mountains exists in Patagonia, at the southern end of the Americas. It is a sublime range, where ice and granite soar with a dancer's grace. From the mountains' feet tumble glaciers and dark forests of beech. The summits float in the southern sky, impossibly remote. Climbers who gaze upon these wonders ache to unlock their secrets. Hard, steep, massive, these might be our planet?s most perfect mountains."